Join the next phase of the social media marketing revolution! Covering subjects ranging from the best-tasting breakfast cereal to the latest developments in cancer treatment, personal interactions are occurring with increased frequency on social media. And if you want to connect with customers, you have no choice but to join their conversations. This much has been established by the mountains of social media marketing literature produced in recent years. 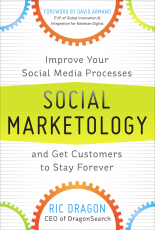 What has not been established are the best practices for creating the most ideal social media strategy for your particular needs -- and that's where this book comes in. In Social Marketology, cofounder Ric Dragon of the renowned search engine marketing firm DragonSearch, takes social media marketing to the next step -- showing how to choose the best tools for your needs and develop a strategy tailored to your goals. The beauty of Dragon's method is its core flexibility. New social media platforms are guaranteed to pop up in the near future. Any strategy based on the methods in this book can be adapted to take full advantage of them. The age of blind trial and error for social media marketers is over. Social Marketology provides the means to implement an effective campaign that is testable, controllable, and fully integrated within broader campaigns and goals.